HOW THE LEOPARD GOT HIS CLAWS (1972) started as a manuscript written by John Iroaganachi in 1967 called How the Dog was Domesticated. When it was published five years later under its final title, the book was credited to Chinua Achebe first, Iroaganachi second. But its authorship is even more complicated. 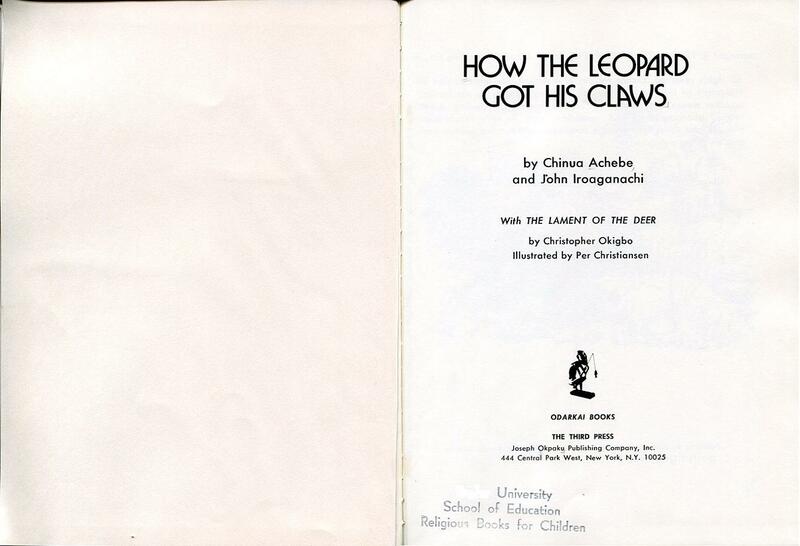 The complete credits read: How the Leopard Got His Claws by Chinua Achebe and John Iroaganachi with The Lament of the Deer by Christopher Okigbo, illustrated by Per Christiansen. Those are a lot of names for one thirty-five page children's picture book. To understand why, you need to have a basic understanding of modern Nigerian history, most specifically an understanding of the Nigerian Civil War, also known as the Nigerian-Biafran War. But before a very rudimentary and poorly informed history lesson, the book. 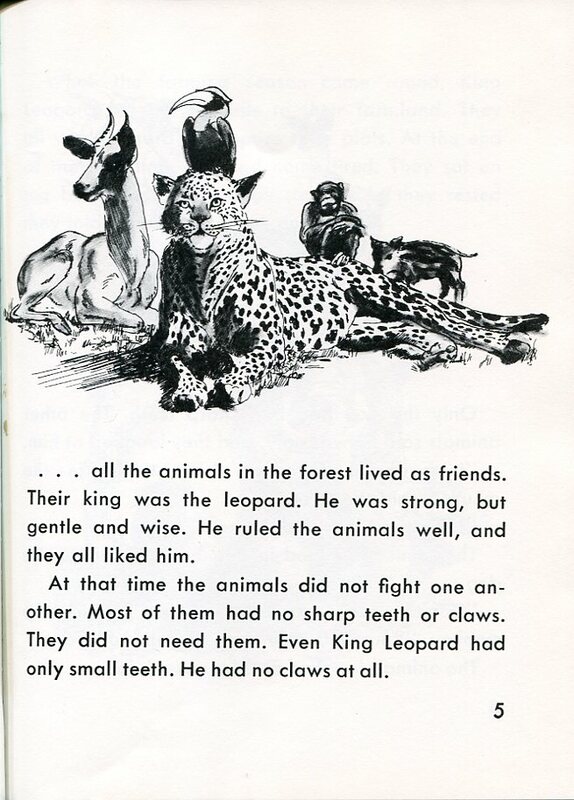 The animals live in edenic peace with the leopard as king. Only the dog has sharp teeth and the other animals mock him for it. One day, the deer approaches King Leopard about constructing a common shelter from the rain. All the other animals embrace the plan...except for the dog who keeps out of the rain in his cave (and the duck, who doesn't mind getting wet). The rest of the animals work hard, each contributing to the construction, and at last complete their work. At the celebratory feast to celebrate the opening of the hall, King Leopard says, "'This hall is yours to enjoy. You worked very hard together to build it. I am proud of you.'" But then the rains come, and the dog is forced from his cave to seek shelter in the animals' hall. 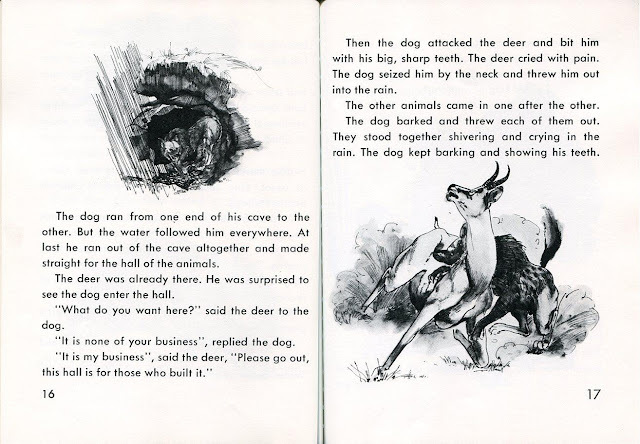 When the deer challenges the dog's right to use the shelter, the dog attacks. The deer calls for help. The leopard, who was away at another village, returns, but without teeth or claws, he is quickly vanquished. His subjects refuse to rally behind him, but rather capitulate to the dog and name him their king. The leopard, injured and alone, leaves. He makes his way to a blacksmith, and says, "'I want the strongest teeth you can make from iron. And I want the most deadly claws you can make from bronze.'" He then goes to thunder, and says, "'I want some of your sound in my voice....Even a little bit.'" Upon hearing his story, both consent, and he returns home armed and ready. 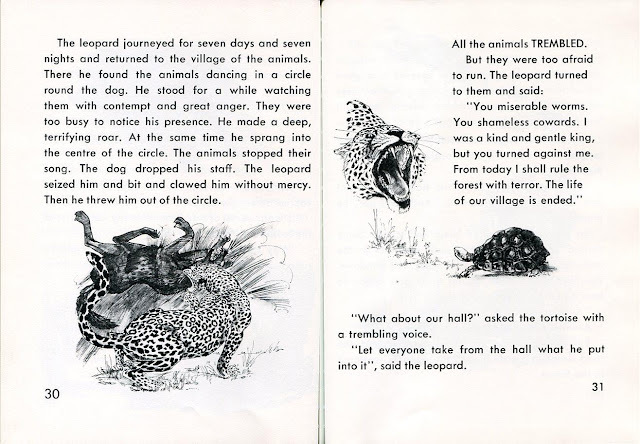 Back home at the shelter, the leopard devastates the dog and subdues his former subjects through fear. They try to claim that he has always been their king, but he announces that the former peace they knew is no more, and from then on he will rule through fear. The dog runs to the human hunter and offers to be his slave in return for sanctuary from the leopard. Today the animals are no longer friends, but enemies. The strong among them attack and kill the weak. The leopard, full of anger, eats up anyone he can lay his hands on. The hunter, led by the dog, goes to the forest from time to time and shoots any animals he can find. Perhaps the animals will make peace among themselves some day and live together again. Then they can keep away the hunter who is their common enemy. 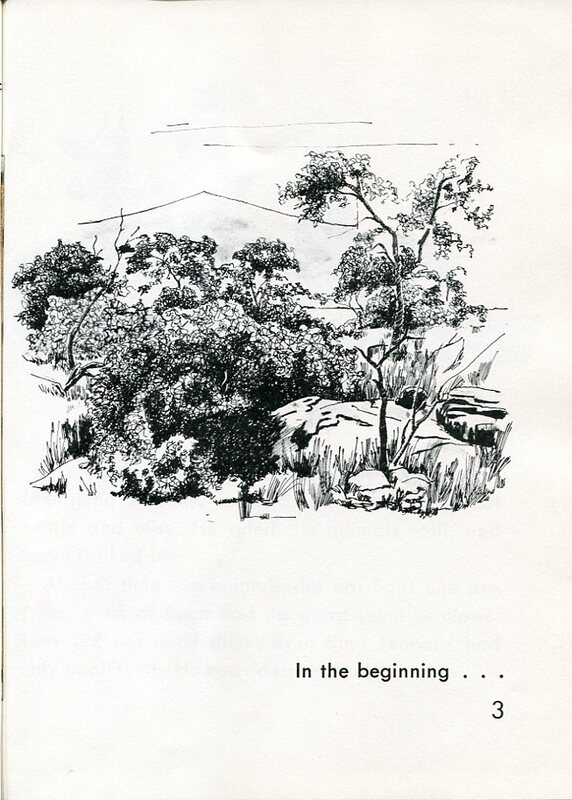 IN EARLY 1967, Chinua Achebe and Christopher Okigbo, the poet and friend who had solicited Chike and the River from Achebe for Cambridge University Press, started Citadel Press to, according to Ezenwa-Ohaeto in Chinua Achebe: A Biography, "publish relevant works by Africans for children, thereby encouraging the exploration of the oral traditions of the people." One of the first manuscripts they received was How the Dog was Domesticated by John Iroaganachi. In that version the dog was a good fellow who was enslaved. 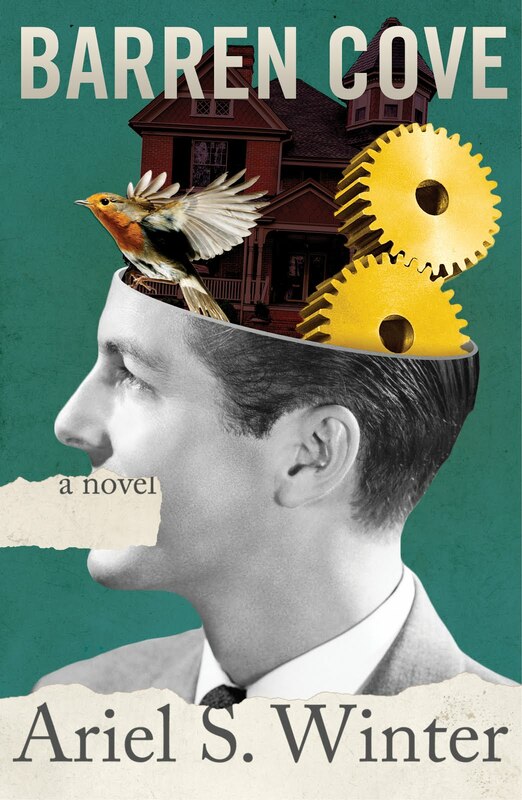 Achebe, however, was seized by the manuscript, and promptly rewrote it, turning it into the quite different story above. In July of 1967, the Biafra region in south eastern Nigeria seceded, declaring itself the Republic of Biafra. When Nigeria sent troops to reclaim Biafra, a civil war began that would last for two and half years. Achebe and Okigbo resided in Biafra. Okigbo joined the army to support Biafra and in September 1967, he was killed. His death ended the newborn Citadel Press. In January 1970, the war ended with Biafra once again part of Nigeria. In post-war Nigeria, there was much discontent and Achebe often found himself in opposition to the government. Friends, Arthur Nwankwo and Samuel Ifejika, started Nwamife Books in order to publicize the horrors of the civil war. Achebe was included in their first publication, an anthology The Insider: Stories of War and Peace from Nigeria. 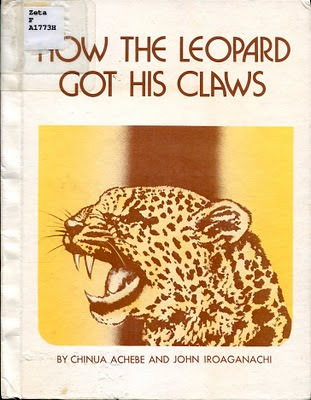 It was through this association with Nwamife Books that How the Leopard got his Claws at last saw print. Okigbo, who had become something of a martyr, had written the Lament of the Deer for the book before his death, and while short and less than inspiring, its inclusion was of great importance. 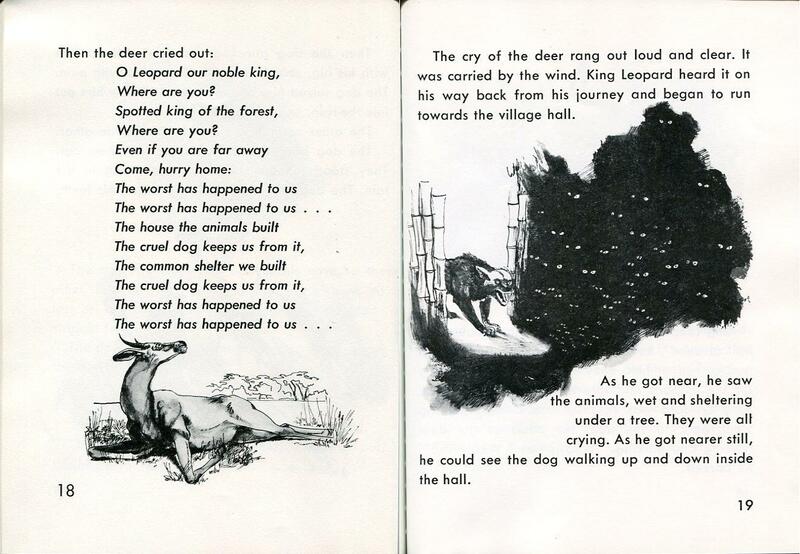 And during the war, the Scandinavian countries had been sympathetic to Biafra, which was how the Norweigian illustrator Per Christiansen was brought on as illustrator, making what seems a simple animal fable into an international book grown out of war. Background on Achebe's composition of How the Leopard Got His Claws came from Chinua Achebe: A Biography by Ezenwa-Ohaeto and The Chinua Achebe Encyclopedia by M. Keith Booker. 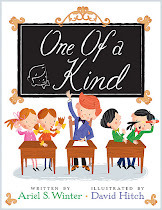 I came across a new version of this story illustrated by Mary GrandPre, and was curious about the background behind it. Your post clears up all my questions about the multiple authors. Thanks so much for the explanation.